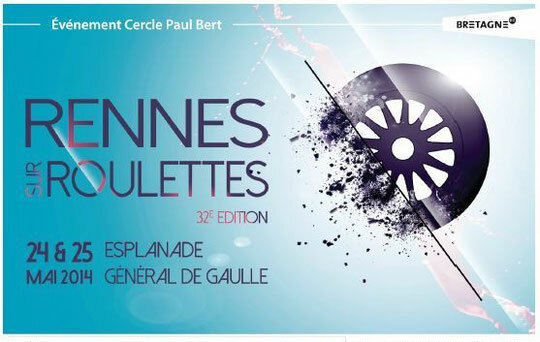 The 32nd edition of skate event "RENNES SUR ROULETTES" took place in Rennes, France, May 24-25. This big event included one of the local steps of the World Slalom Series as well as the speed skating and skate-cross world cups. 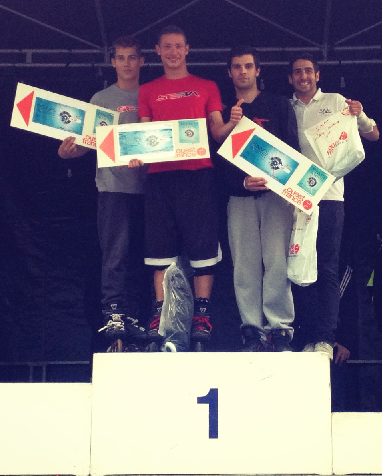 The best french skaters were competing in speed slalom and freestyle battle. The weather was not particularly good for skaters and public. 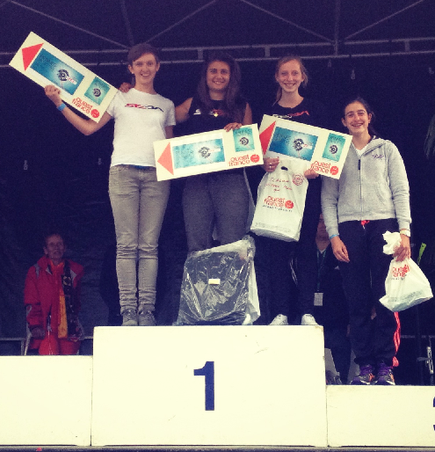 It was not so easy to finish all the scheduled disciplines on time but, despite the rain, skaters did good performance. This event was a good and interesting warm-up before the Paris Slalom World Cup. Tiffany Derisbourg (Fra, #15) met Zoé Granjon (Fra, #3) in the final. Tiffany Derisbourg, nervous at the beginning, needed 3 runs to beat the new world number 3. Caroline Kerbrat (Fra, #56) took the third place. Fort brothers, Yohan (Fra, #27) and Jimmy (Fra, #22), were competing for the victory in the final. This time, Yohan, the elder brother, was faster and won the Men's Speed Slalom Final. Romain Lebois (Fra, #8) finished third. Interview: What are your feelings about your result in Rennes and what do you expect for PSWC? Of course i am happy to win but i would rather win with two runs instead of three. I was nervous during the final because Zoe is a real competitor for me but luckily i could do my best and took the first place. At the PSWC i hope to be strong enough to go through the qualification and then to take a place on the podium. So see you there! I hope it will be a great event like always! I am very happy with my victory. It is always good to compete with my little brother. This competition was a lot of fun but also a good training before the big one at the PSWC next weekend. I hope to see as much people as possible at the PSWC. I look forward to spend a great time with all the skaters over there. In the final of the Women's battle, Zoé Granjon (Fra, #7) took the first place easily leaving behind her the other competitors. Eva Cochey-Cahuzac (Fra, #52) showed also a very good performance and was ranked second. Nahéma Pham van Hué (Fra, #180) and Roxanne Anquetin (Fra, #92) took the third and fourth places respectively. Romain Lebois (Fra, #1) won the Men's Battle final. He showed a high level of technique with smooth a stylish moves and made a very good performance for the public. Alexandre Claris (Fra, #6) also showed an excellent level and took the second place. Nathan Menard (Fra, #38) and Ambroise Nicolao (Fra, #49) took the third and fourth places accordingly. Interview: What is your feelings about your result in Rennes and what do you expect for PSWC? The competitions were very good despite the weather and rough floor. Luckily the sun came back for the battle so everything was great. For the PSWC i will try to fight with the difficult floor conditions and to do my best to get a good result. I wish all the best to all the skaters who will come and i look forward to be there. I am very happy with my result. I liked this event because i was enjoying my skating. I tried to make a good show for the public to introduce the freestyle slalom to the people. For the PSWC i hope to skate good. i will do my best to reach the final and try to beat Zhang Hao (Chn, #9). I look forward to be there. The atmosphere between skaters is so good as for every PSWC. I hope that a lot of skaters will come to enjoy skating together.